This circuit was found in a cheap "plasma mug" - a double wall partially evacuated and gas-filled clear glass mug that glows in strange patterns when sitting on the energizer base, depending on how it is touched or held. The circuit is the typical one transistor oscillator driving a small potted transformer. Q1 was on a heatsink. The hard potted HV transformer occupied a volume of less than 1 inch cubed. Only the resistances of its windings have been measured so far. Someday I may get around to determining more about it. The listed power requirements for this unit were 12 V at 250 mA. It would run on either 8 AA cells or a wall adapter. There was also a power switch as well as the usual third contact on the power jack to disconnect the battery when using the adapter (not shown). +12 o--|>|--+--------+-----+------------------------+ ::(       (3" diam. This adds a gain stage to improve regulation compared to the circuit in the section: Higher Current Operation and is shown using an adjustable regulator though a fixed regulator could also be used. This is similar to the circuit in the Texas Instruments LM317 datasheet. Although not specified, I expect this is good for up to 5 A or more depending on the actual voltage difference between input and output and the size of the heat sink used for the power transistor, Q2. Using this configuration rather than something like an emitter follower provides much better regulation since the point of regulation for the LM317 is still the actual output of the circuit. For even higher current operation, multiple power transistors (Q2) can be wired in parallel as a pass-bank with small (e.g., 0.1 ohm) emitter resistors to balance the load. In this case, Q1 may need to be a slightly bigger transistor and R4 reduced in value to provide adequate base drive. Details will depend on your particular needs. As it turns out, the bipolar transistors can be replaced by IRF9630 MOSFETS. The only other modification required is to change the value of the 5 ohm resistor in order to properly bias the MOSFET. This is significant because MOSFETs can be easily arranged in parallel without having to worry about the inconsistent BETA of parallel BJTs. Here is a cute circuit that gets around both these problems. The original article is from George Hrischenko but the link no longer works. However, the circuit described in the section: Super Simple Inverter only requires off-the-shelf components but has a pitiful efficiency. But construction is, well, super simple :-). I just experimented with rebuilding it a bit. 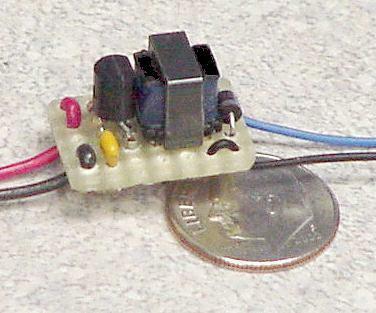 It works fine with a home-made transformer using an E 25 core (25 mm core width, or 0.79"). I tried both an un-gapped (AL = 1750 nH) and a 0.4" gapped (on central leg; AL = 151 nH) version. Concerning efficiency, the result was more or less the same, but due to the higher switching frequency with the gap, there was no buzzing sound from the transformer. It worked even with 32 primary and 350 secondary turns, secondary wound first with the output and feedback winding not side-by-side but one over another. It's also great as an inverter for use with a G4 to T5 to erase EPROMs, as I discovered. Transistors with low gain don't seem to work well - BD237 and 2N5191 were reasonably good. It's easy to have it operate at more power - just decreasing the 5.1K resistor and adding a small heatsink works great. The same basic circuit could be used on 220 to 240 VAC, 50 Hz but the voltage ratings of the filter capacitor and possibly the transistors would need to increase, and probably some other changes would be needed. This in fact is what 230 VAC CFL ballasts do. See Pavouk.org - Compact Fluorescent Lamps. 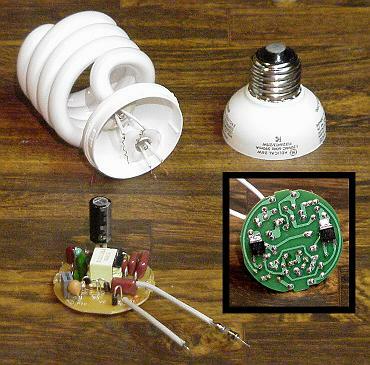 There are schematics for at least 11 different model CFLs! The Mini Power Supply Based on Modified Kodak MAX Inverter shows the simplified circuit. The original circuit board can be used and is very convenient though a more compact unit can be constructed if you use a bit of perf board or your on PCB. The output is taken across C2 (between +V and -V). In the original photoflash, its value was 160 uF. But for the inverter, C2 can be much smaller. As drawn, the output voltage is around 5 to 6 VDC. Note that for higher voltages, Q2 in the original MAX schematic may be needed. For low voltage operation, performance is much better without it. I don't know what the break-even point is so you may want to leave a spot for Q2 just in case. So for 4 VDC, N = 26 (as drawn); for 50 VDC, N = 256; and for 300 VDC, N = 1506. I have done the modifications for the 4 VDC version by removing the original 1,750 turn secondary (I had to do this anyway so I could confirm the number of turns for the circuit description) and replacing it with a 26 turn winding of #32 wire. Unfortunately, I also had to Epoxy the half dozen pieces of the ferrite core back together after somewhat destructive disassembly but I don't think there are any significant gaps left in the core. :-( I've heard that soaking in Methylene Chloride for 24 hours may allow these transformers to be disassembled without damaging the bobbin or core, but this stuff also dissolves internal organs, so use with caution. Alcohol or acetone may also do the trick if given enough time. I confirmed that the transformer still worked by installing another set of undamaged original windings and checking that it still charged and fired the flash properly. With no load and the new windings, the output reaches about 5 V in a fraction of a second. Also see the section: Ultra-Compact 350 V Capacitor Charger. RU1, the MOV (Metal Oxide Varistor), is the same sort of part found in a surge suppressor and is there for the same purpose. CR5 was not marked but is probably a fast recovery rectifier like an FR105 since it is part of the high frequency circuit. The original source of the this circuit was from Circuitos Corporation. However, the original design used an ORP12 as the sensor instead of an LED. And it didn't work. Evidently, it was never tested. However, note that unless the potentiometer used is well behaved near its end-points, there will be changes in both frequency and duty cycle may occur at one end at least. Multiturn pots tend to be well behaved but some single (partial) turn pots are not. This circuit will drive a resistive DC load with an output from about 2 to 98 percent duty cycle. As drawn, the load voltage is assumed to be between 20 and 30 VDC with a maximum current of about 5 A. A standard-blow fuse with a current rating just slightly above the expected maximum average current should be provided in series with the power supply. 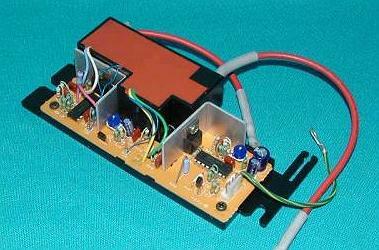 PWM1 is based on the SG3525 PWM controller IC, normally used for switchmode power supplies. While a 555 timer can implement a similar capability, I don't know of a simple setup that provides an output that has the same wide range and linearity. With trivial changes, a wide range of other types of loads can be accommodated. With LC smoothing filter, inductive loads like DC motors can be used. The pot can be replaced with an external signal input if desired. Or, a voltage derived from the output can be fed into the error amplifier instead to provide closed-loop regulation. Using a voltage derived from a sense resistor in the source return can be used to implement a current regulated drive. The SG3525 (U1) will run with supply voltages above 30 VDC, so the zener circuit really isn't essential. Alternatively, if the output needs to be lower or higher, U1 can be powered from a separate supply. Get the schematic for PWM1 in PDF format: PWM1-SCH. Note: While I show the unused inputs floating and it works that way, it may be a good idea to ground SYNC (pin 3) and SHDN (pin 10) if they aren't being driven since I once saw some funny behavior when built on a protoboard (one of those things having push-in wire strips) with these signals floating.